With a mixture of vision and nostalgia, the seat owners of the New York Stock Exchange voted Tuesday to acquire Chicago-based Archipelago Holdings Inc., a deal that will transform the 213-year-old Big Board into a for-profit company with new, high-tech trading capabilities. More than 95 percent of the voting members approved the $9 billion transaction, according to the NYSE. More than 90 percent of the exchange's 1,366 seats were represented in the vote, tallied in the exchange's sixth-floor conference room, considered a Wall Street institution. "There certainly was some nostalgia there," John Thain, chief executive of the NYSE, said in a conference call with reporters. "A lot of attendees were members for many, many years, and they wanted to be present at this historic transaction and say that they were there." Archipelago shareholders, meeting in Chicago, approved the transaction earlier Tuesday, though the margin of the vote was not disclosed. The acquisition, expected to close in late January, will create a new publicly held corporation, NYSE Group Inc., with the exchange and Archipelago becoming divisions of the company. The new stock will be listed on the NYSE as NYX one day after the deal closes. A secondary stock offering has been tentatively set for late February or March, Thain said. Its storied history and iconographic status aside, the NYSE has been under heavy competitive pressure from the Nasdaq Stock Market Inc. and other electronic trading platforms in the past decade. While the exchange prides itself in its floor auctions, which help reduce price volatility, modern stock traders have been drawn to Nasdaq's transaction speeds, where a penny price difference could mean thousands of dollars made or lost. Some of that competitive pressure came from Archipelago itself, which has increased its share of NYSE-listed stock trades in recent years, but has also seen intense competition from other electronic trading platforms. The new company will have the capability to not only trade stocks listed at the NYSE, but also Nasdaq-listed and over-the-counter stocks through Archipelago's electronic trading system. The deal also increases the exchange's market share in exchange-traded funds and derivatives trading. As the NYSE prepares to take on all-electronic rival Nasdaq Stock Market Inc., investors are likely to benefit from better transaction speeds as well as lower fees as the two major markets compete for business. The transformation into a for-profit company gives the NYSE Group equity it can use for expansion and further acquisitions. "I continue to believe there will be more consolidation both in the U.S. and globally, and this transaction positions us to be a participant in that consolidation," Thain said. "I can't talk about any specific area, but I think that there will be opportunities for us over the course of next year." Under the agreement, NYSE seat owners will receive more than $5 million for each seat, though just $300,000 in cash. The rest will be stock in the new company, which seat owners will be restricted in selling for up to three years. Archipelago shareholders will have their shares transferred to the new company on a one-for-one basis. Although Archipelago shares were down 43 cents at $59.95 in trading Tuesday, shareholders have seen the value of their stock quadruple since the merger was announced April 20. In addition, the value of seats on the exchange rose from $975,000 in January to a record $4 million last week. Two more seats sold for that amount Tuesday before the vote. Seat sales will be halted Dec. 31, Thain said, as part of the deal's final steps. 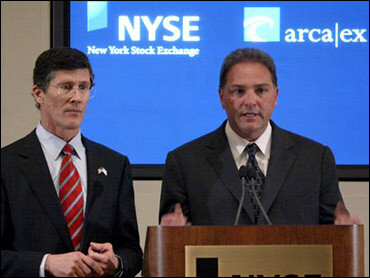 While NYSE seat owners roundly approved the deal, a small group of dissidents, led by longtime seat owner William Higgins, had fought the deal in court, saying Goldman Sachs Group Inc.'s involvement in advising both Arca and the NYSE led to severe conflicts of interest. Higgins settled last month after the NYSE agreed to have Citigroup author a fairness opinion on the deal. Citigroup concluded that the deal was fair to all involved. And just hours before the vote, a group of floor brokers calling themselves the Independent Broker Action Committee issued a statement criticizing the NYSE's hybrid market initiative — a move to marry the floor trading system with increased electronics. The NYSE must implement a "fast-market" technology platform before summer under a Securities and Exchange Commission mandate. The floor broker group said the NYSE's hybrid system would leave floor brokers out of major trades, limiting their access to liquidity and threatening their livelihoods. Thain said NYSE officials have spent hundreds of hours with floor brokers, and that the system was still being developed. "While a small number of people, although vocal, are opposing this, the vast majority of brokers are very supportive," Thain said. Membership, or "seats," at the exchange, represented both an ownership stake and the right to trade stocks on the floor. Those trading rights will now be auctioned off each year in a Dutch auction format to those companies and individuals who are now members or lease those rights from members. The exchange will keep those revenues, which used to go to seat owners. "We're still going to call them seats, because we want to maintain that this is a special place to work, and that the floor is a special place," Thain said.